Both AWB and ILB requested to go to Llanddulas, 8 miles west of station, to a report of an object in the water off the jetties where the coasters load stone. Police helicopter NW1 was on scene and reported object was just a piece of timber, and Holyhead Coastguard stood all units down just as the AWB carriage was on the water’s edge. The ILB had already launched. The AWB returned to station by 1214. AWB requested to come to immediate readiness (ready to launch, at the water’s edge), as a full-scale incident alert was called at the Douglas oil and gas rig, 12 miles off Rhyl. Hoylake lifeboat was also tasked the same. Our station boat, 12-24, was on engine trials off Puffin island, Anglesey, and was also asked to proceed. After about 5 minutes, the coastguards reported the incident was over, and all units were stood down. The new relief lifeboat had only arrived on station a matter of hours before, when it was called into action for the first time at Rhyl. The fishing vessel “Mistral 23” was aground in surf at Talacre beach (west) with 3 persons on board. The ILB had already launched to assist. When the AWB arrived on scene at 2030, the ILB was used to take the tow line from the AWB, through the surf, to the casualty. This was successful the first time, and the boat was towed away from the beach, through the surf, into deeper water. The tow was continued for the 8 miles back to Rhyl harbour, arriving there at 2240.The tow was passed to the ILB to secure on a mooring, and the AWB left the harbour, leaving the ILB to transfer the boat’s crew to coastguards on shore. The AWB returned to station by 2355. Relief Lifeboat 12-11″Lifetime Care” services from 10/8/2005. Relief boat on station at 1700 on 10/8/2005. The AWB was requested to launch by Holyhead coastguard to evacuate the owner of the yacht “Catchem”, about 2 miles north of Rhyl, who was suffering some sort of anaphylactic shock and allergic reaction, which was affecting his throat and causing problems. The AWB launched and was alongside the casualty in 12 minutes. 2 crew members were put on board the yacht to assist with it’s passage to West Kirby on the Wirral, and the AWB returned to station, where the man was transferred to an ambulance and taken to hospital. The AWB was re-housed and the service was continued by the ILB (see ILB report). AWB ready for service by 1322. AWB launched to assist ILB with numerous inflatable objects being blown out to sea due to the strong southerly wind and ebbing tide. The main job for the AWB crew was to search for an inflatable with 2 persons reported on it, being blown out about 1.5 miles out off Abergele. Rescue helicopter 122 from RAF Valley was also searching together with the ILB. The ILB had picked up an inflatable pool and an inflatable dolphin previously. The search was carried out for 2 miles long the shore, also involving Rhyl mobile coastguard patrol, and up to 3 miles out but nothing was found and no persons were reported missing. The search was called off at 1531, and the AWB was back at the boathouse by 1622. AWB put on immediate readiness as ILB had reported engine problems. Engine was fixed before AWB came out of boathouse, so AWB stood down at 1330. 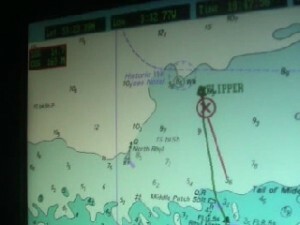 The yacht “Blue Osprey” with 2 people on board, had become becalmed off the wind farm and their engine had failed. The wind farm support vessel “Celtic Wind” had found the yacht and had towed it away from the immediate danger of hitting the towers. The AWB launched and was on scene in 22 minutes. The yacht was heading for Liverpool. It would have been difficult to take the yacht into Rhyl harbour due to the congestion of boats, and so the tow was started towards Liverpool. Consultation between the lifeboat and Holyhead and Liverpool coastguards followed. It was agreed for Hoylake lifeboat to come out and rendezvous with the AWB off Hoylake, and for Hoylake to take the boat the remaining way to Liverpool. This was done and the AWB returned to station by 2120. AWB requested to launch to take over from the ILB. the 26-foot fishing boat “Pathfinder” had suffered engine problems at the entrance to Rhyl harbour, and had drifted over the river entrance marker wall and was stuck on one of the perch poles. 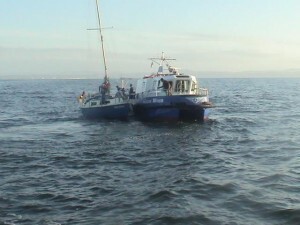 the AWB took the 7 persons on board and towed the boat off the wall and put it on a mooring in Rhyl harbour. The AWB returned to station at 1405. AWB launched to assist ILB with locating and towing small speedboat found drifting off Talacre. Boat taken to Barkby beach in Prestatyn, and major air-sea-shore search carried out with nothing being found. AWB returned to shore at 2105. The AWB was launched as a back-up to the ILB after the windfarm support vessel “Top cat” found an unmanned dinghy off Kinmel Bay. The boats were also joined by rescue helicopter 122 from RAF Valley in Anglesey. After 2 hours the search was called off as no-one had been reported missing. The AWB returned to station by 1820. See also ILB report. The AWB was launched after the 19-feet long motor vessel “Gladys”, with 4 people on board, contacted Holyhead Coastguard to report they had run out of fuel, 3 miles North-East of Rhyl, by the Prestatyn buoy. The AWB took out both diesel and petrol, as it was not known which fuel the boat was using. The boat was located, 2 of the passengers were transferred to the lifeboat, and 2 crew members boarded the casualty with fuel. Once filled up, the casualty was able to restart the engine, and so the AWB escorted the boat back to the entrance at Rhyl harbour. The crew and 2 casualties were transferred back to their own boats, and the fishing vessel “Jensen” followed the boat into Rhyl harbour, and the AWB returned to station, being ready for service by 2030. AWB requested to come to immediate readiness after the Liverpool-based fishing boat “Atlantis” reported a sick man on board. The original position was given as off the wind farm, but it transpired that it was nearer to Hoylake than Rhyl. As Hoylake were temporarily off service, Liverpool coastguard decided to send West Kirby ILB rather than Rhyl, so the crew at Rhyl were stood down at 1040. AWB requested to stand by as ILB launched to report of boat possibly in difficulty off Prestatyn. ILB launch cancelled as boat made it ashore safely. AWB stood down at 2345. see also ILB report. …… and met up with the vessel “Celtic Wind”, skippered by one of our crew members. It turned out that the injured man was another crew member. 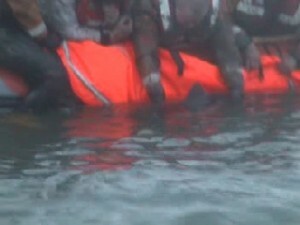 He was transferred to the lifeboat, and returned to shore at 1330. He was transferred by ambulance to hospital and treated for a badly-gashed head. The lifeboat was ready for service by 1400. The windfarm support vessel “Celtic Wind” contacted Holyhead Coastguard to inform them that the windfarm towers had 4 maintenance men inside them, and the support vessel could not access the base of the towers due to 2.5m high waves and strong winds. The men were happy to stay inside the towers, but they had no supplies to last them through the night, should that be necessary. Assistance was then requested for the AWB to go out with the supplies, so that the men could winch them up to the base platform of the towers. The AWB crew therefore waited for 40 minutes until the windfarm company delivered the supplies in 3 containers to the boathouse. The AWB was launched at 1256, and arrived at the 1 tower some 17 minutes later. The supplies were attached to lines and lifted up to the platforms on 2 of the towers. Once all was safe, the AWB then escorted “Celtic Wind” back to Point of Air and sheltered waters, then returned to station at 1600. The men remained on the towers until 2000 when the weather abated and they were able to be picked up by the support vessels. AWB requested to back up ILB proceeding to Prestatyn t reports of 3 people stuck on a sandbank off Presthaven sands Holiday Camp. The ILB had launched 6 minutes earlier. The AWB arrived on scene at 1255 and searched with the ILB on a parallel search down the coastline. the coastguard mobile patrol was also on scene. They had seen other people on a separate sandbank but had now lost sight of them. The 3 original casualties were escorted off the sandbank by the coastguard with the ILB in attendance, whilst the AWB stood off 1/4 mile off shore. The 3 were OK after their escape, and the search continued for the other people 1/2 mile to East. Some were seen going over the sand dunes and it was assumed that they were the people the coastguard saw. The search continued for another half hour when all units were stood down, the AWB returning to station by 1437, the ILB arriving home at 1420. Numerous reports were received by Holyhead Coastguard , stating a red flare had been seen off Rhyl. The Coastguard team and the AWB were paged and the boat launched by 2307. A search was conducted up to 2 miles offshore on a parallel track search , and Coastguard teams and the shore crew assisted with a beach and promenade search. This was the first time our new Landrover was called into action, as it had only been delivered at 4.30 pm that day. The police helicopter NW1 also helped in the search with it’s FLIR unit (forward-looking infra red). Various targets were investigated but nothing was found, or they turned out to be navigation buoys with their lights out. The search was called off at 1.55am Tuesday. Reports had said that the flare was seen very close to the shore line, with some even stating it may have come down in the town centre. All units were stood down, the AWB being ready for service by 02.30 Tuesday.